El Nino Ventures Inc. (ELN-TSX) signed an option agreement regarding the sale of its minority interest in the Murray Brook Polymetallic Project in New Brunswick (News Release: Oct 13th, 2016) with Puma Exploration (“Puma”). Puma announced the signing of the definitive Option Agreement with Trevali Mining Corporation (TV-TSX) to allow Puma to Purchase the Murray Brook Project along with other considerations. On April 30, 2018, Puma made its second payment of $1.5M to ELN towards its buyout option. The terms of the sale agreement with Puma are: $3.1 million dollars cash; a laddered Net Smelter Return (NSR) up to 1.7% of ELN's minority interest in the royalty; and 2 million share purchase warrants of Puma Exploration. The third and final payment of $1 million is due on or before May 10th, 2019. In the event Puma does not complete its option to acquire ELN's interest ELN will receive its entire interest in the Murray Brook project back. The company is currently evaluating other mineral projects. Management may also consider investments outside of the mining industry, which may require shareholder, director, and regulatory approval. Three new gold projects were acquired in Q1 of 2018 in Newfoundland. The new land position contains geology similar to that of White Metal Resource's (TSX.V WHM) new gold discovery, Gunners Cove. The company is presently planning a program with follow up field work. El Nino is now provincially registered in Newfoundland to conduct mineral exploration. May 1st, 2018 Rockport, Canada -- El Nino Ventures Inc (TSX.V: ELN; OTCQB: ELNOF; FSE: E7Q.F) is pleased to update our shareholders on the acquisition of the Murray Brook Project by Puma Exploration Inc. ("Puma"). Puma announced the signing of the definitive Option Agreement with Trevali Mining Corporation (TV-TSX) setting the terms of the development and the exploration of the Murray Brook Deposit (M.L.252) and the signing of the Strategic Alliance Agreement (''SAA'') setting the terms of the exploration of combined mining properties in the Restigouche--Armstrong Belt region of New Brunswick. On April 30, 2018, Puma announced they've received an amount of $1.5M from Trevali, which was used to make the payment of $1.5M due to ELN. El Nino Ventures (ELN) Chairman and CEO Harry Barr states; "The Company is pleased to update its shareholders on the acquisition of the Murray Brook Project. We are appreciative with Puma's efforts in arranging the financing as well as meeting the payment requirements to ELN. The payment of $1.5M will be added to ELN's treasury and will be used for new acquisitions for the company and or working capital." 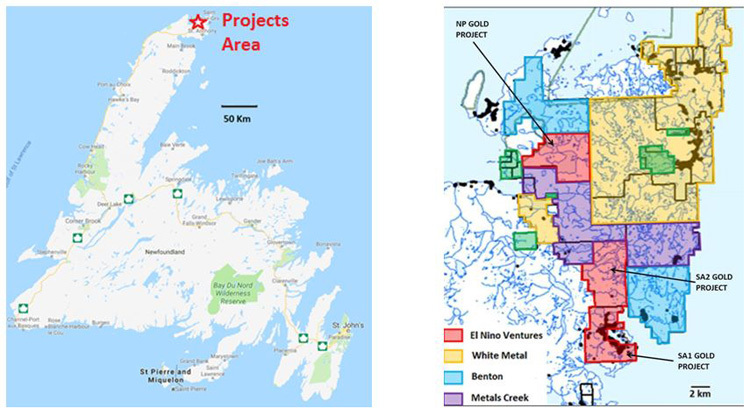 In the first quarter of 2018 ELN acquired three gold projects in the Great Northern Peninsula of Newfoundland (Figure 1). The claims were staked to follow up on the new Gunner Cove gold discovery of White Metal Resources. El Nino's three gold projects are situated around the city of St. Anthony and northward (Figure 2 above), covering approximately 22 kilometers of favorable geology, similar to that being encountered on the Gunners Cove Project to the east and north of the company's three gold projects. The claim blocks consist of 218 claim units for approximately 18,980 hectares (approximately 46,900 Acres). The company is presently planning a program on its three gold projects in Newfoundland. ELN is currently seeking option/joint venture partners on one or more of the above mentioned projects and the company's technical team continue to plan for a phase one exploration program on the projects. ELN signed an option to sell agreement regarding the sale of its minority interest on the Murray Brook Polymetallic Project in New Brunswick (News Release: Oct 13th, 2016) with Puma Explorations. 2 million share purchase warrants of Puma Exploration. Recent revisions of the contract (News Release: Nov 6th, 2017) with regard to the Puma Exploration deal has the second payment from Puma of $1,500,000 due for May 10th, 2018. The 3rd and final payment of an additional 1 million (total $3.1 million) is due by April 30th, 2019. The NSR will start at 0.25% at a zinc price of US$1.04/lb and will increase in increments of 0.25%, to a maximum of 1.75% above US$1.50/lb Zinc. This NSR, which is in relation to approximately 32% of the production from the Murray Brook Property, and includes the Mining Lease and the Camel Back claims, for the life of the Murray Brook deposit and any new discovery made on the total project. On April 30th, 2018 the price of Zinc was $1.41/lb USD according to Kitco. Year 2 to Year 3: a 20% premium to the price indicated in 2) above. In the event Puma does not complete it option to acquire ELN's interest ELN will receive its entire interest in the Murray Brook project back. In addition, the Company announces that it has granted 300,000 incentive stock options to consultants of the Company at an exercise price of $0.07 per share for a period of five (5) years from the date of grant in accordance with the Company's Stock Option Plan.&nbsp; The Stock Options granted will be subject to vesting restrictions, acceptance by the TSX Venture Exchange and will be subject to regulatory hold periods in accordance with applicable Canadian Securities Laws. El Nino Ventures Inc. (ELN) has in the past years been an international base metals exploration company with its focus being on the Murray Brook Project in the Bathurst region of New Brunswick, Canada. The Company also has an Aggressive Mineral Acquisition Program Underway with a focus on gold and base metal projects that are a mix of grass roots, brownfields and advanced stage projects. The Company plans to use the Prospector Generator Model which reduces risk, share dilution and increases discovery potential. If you have not done so already, we encourage you to sign up on our website (www.elninoventures.com) to receive our updated news. The contents contained herein that relate to Exploration Results or Mineral Resources is based on information compiled, reviewed or prepared by Carey Galeschuk, P.Geo, a consulting geoscientist for El Nino Ventures.&nbsp; Mr. Galeschuk is the Qualified Person as defined by National Instrument 43-101 and has reviewed and approved the technical content of this news release. Neither the TSX Venture Exchange nor its Regulation Services Provider (as that term is defined in the policies of the TSX Venture Exchange) accepts responsibility for the adequacy or accuracy of this release. Cautionary Note Regarding Forward Looking Statements: This release contains forward-looking statements that involve risks and uncertainties. These statements may differ materially from actual future events or results and are based on current expectations or beliefs. For this purpose, statements of historical fact may be deemed to be forward-looking statements. In addition, forward looking statements include statements in which the Company uses words such as &ldquo;continue&rdquo;, &ldquo;efforts&rdquo;, &ldquo;expect&rdquo;, &ldquo;believe&rdquo;, &ldquo;anticipate&rdquo;, &ldquo;confident&rdquo;, &ldquo;intend&rdquo;, &ldquo;strategy&rdquo;, &ldquo;plan&rdquo;, &ldquo;will&rdquo;, &ldquo;estimate&rdquo;, &ldquo;project&rdquo;, &ldquo;goal&rdquo;, &ldquo;target&rdquo;, &ldquo;prospects&rdquo;, &ldquo;optimistic&rdquo; or similar expressions. These statements by their nature involve risks and uncertainties, and actual results may differ materially depending on a variety of important factors, including, among others, the Company's ability and continuation of efforts to timely and completely make available adequate current public information, additional or different regulatory and legal requirements and restrictions that may be imposed, and other factors as may be discussed in the documents filed by the Company on SEDAR (www.sedar.com), including the most recent reports that identify important risk factors that could cause actual results to differ from those contained in the forward-looking statements. The Company does not undertake any obligation to review or confirm analysts' expectations or estimates or to release publicly any revisions to any forward-looking statements to reflect events or circumstances after the date hereof or to reflect the occurrence of unanticipated events. Investors should not place undue reliance on forward looking statements.